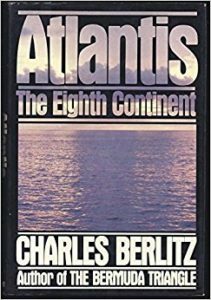 Atlantis: The Eight Continent  by Charles Berlitz, is a run of the mill Atlantis book that places the lost civilisation in the Atlantic. Berlitz stresses the similarity between cultures on both sides of the ocean and should have stuck with such standard fare. However, when the author introduces suggestions of Atlantean nuclear experiments going awry, the intelligent reader can be forgiven for deciding to recycle this volume through their local charity shop.